On the night of Nov. 14, the Ukrainian Federation was packed, but not for one of the intimate concerts the part-time Mile-End venue is known for. Rather, the crowd had gathered to see a writer. 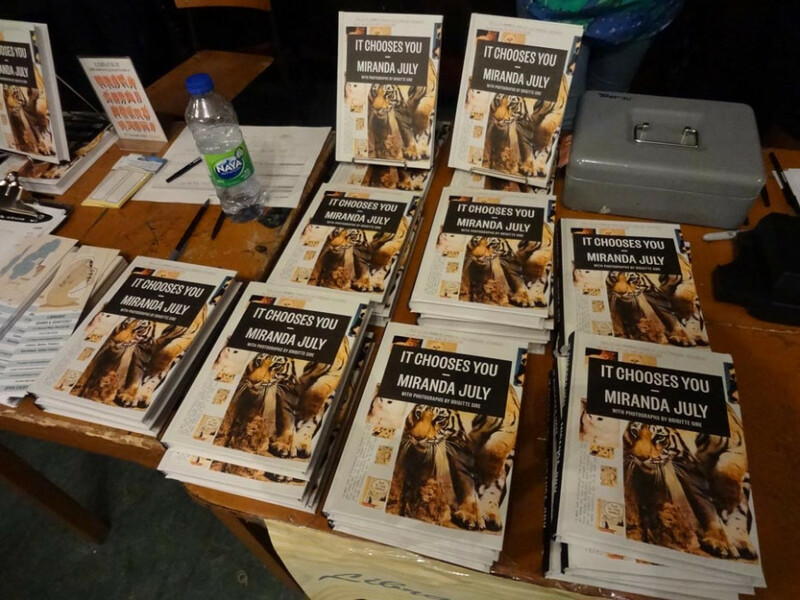 Miranda July, the woman responsible for the films Me, You and Everyone We Know and The Future was there to read from her new book, It Chooses You. 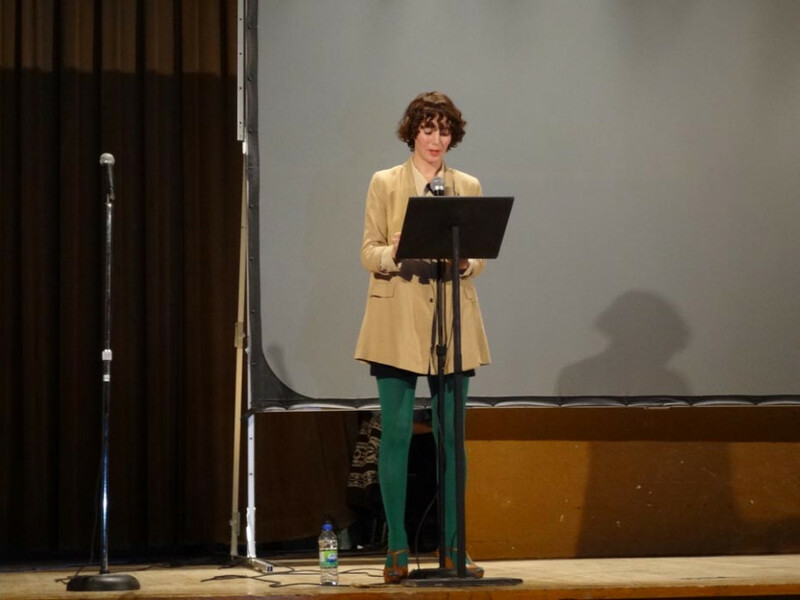 July, clad in emerald green tights, white collared shirt, skinny black tie and a beige trench coat, approached the microphone with a sort of clumsy grace. She was pressing her palm. She explained that her right palm pulsates when she has a crush on someone or when she has a new idea. It was clear that her personality was not out of step with the friendly charm her writing exudes. Her previous publications include No One Belongs Here More Than You, a collection of short stories, and Learning to Love You More, a text accompanying an interactive web art project that goes by the same name. July has also dabbled in performance art and music videos in addition to her burgeoning film career. Sheila Heti, a Canadian author, journalist and the interviews editor for The Believer, introduced July as being one of the most inspiring contemporary artists, citing July’s multi-disciplinary body of work. “She knows what to do with her energy,” said Heti. She then pointed to July’s fascination with the you (the word appears in all of her major works’ titles) as one reason she is able to make such strong connections between herself and her reader. “She is an amazing artist who is thinking about you,” said Heti. It was clear from the packed room that July is, in fact, a fascinating contemporary creator and thinker, an artist who truly wants to understand and reflect the people and world around her. July spoke candidly about the struggles she faced with the writing of It Chooses You. The book is a creative non-fiction narrative that traces July’s journey into strangers’ homes through answering ads in the local classifieds. It was a conscious break from the Internet that inspired July to write the book, however, although she admitted to the audience that, in actuality, she originally had no idea where the book was going or what medium she would translate it to. It was on her self-imposed Internet-break that she stumbled upon her local classified ads. She said she was intrigued by them because “they weren’t fiction. These were real people,” July said. “Most people said no,” said July. Some, however, agreed. The end-result of her experiences is documented in It Chooses You. July first read to the audience a chapter about Ron, a man selling an art set for $65. Ron is a self-professed ‘corporate owner.’ “Asking a question was like merging onto a highway,” July reads. In the story, July describes Ron’s explanations of his job as if he were throwing confetti out in front of her, admitting numbers have never been her thing. Between reading chapters, July played clips of people in the audience giving compliments to others present. The compliments were given on the premise that they were giving the compliment that they’d always wanted to receive themselves. She also got an audience member to come onstage to sing the chorus from the Miley Cyrus song “The Climb,” enacting a scene in the plot. July’s willingness to involve the audience with her reading was not unlike the experience of reading her prose—you know that she wants you to feel safe, welcome and happy. Her classified cold-calling took her to the home of Domingo, who became July’s focus in the story. The story about Domingo, a “large, gentle and nervous” man was the most captivating of her readings. Another segment introduced the audience to a woman selling a “very old” blow dryer in Sun Valley, a part of California July described as looking like Tupperware. The book sways between July’s interactions with strangers such as Ron and Domingo and actors such as Don Johnson from Miami Vice. At the same time July was pursuing It Chooses You, she was also doing casting for her most recent film, The Future, which hit theatres in August. “Feeling is important,” she added. When asked about the Internet, July laughed. “Just to bring it back to where we’re all going after this,” she said. She admitted that rookiemag.com, a self-proclaimed “web site for teenage girls,” was one of her favourite websites. It’s not surprising that this first-time reading of the new book had packed the Ukrainian Federation or managed to leave everyone filtering out of the space with smiles on their faces. She’s not afraid of being honest and self-reflective. She’s not afraid to make fun of herself, or share her candid thoughts. She’s an effortless storyteller who has the ability to make you laugh out loud and want to cry in the same sentence. She is a woman who clearly has embraced all her creative urges and, as Heti said when introducing her, July is clearly thinking about us.